A great music event in aid of Children in Need. Children In Need Rocks was first staged in Manchester in 2011, and raised more than £2.5 million for the British charity. 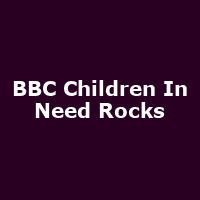 2018's BBC Children in Need Rocks features George Ezra, Jess Glynne, Nile Rodgers & CHIC, Olly Murs, Rita Ora, Sir Rod Stewart and more, hosted by Fearne Cotton and Clara Amfo.